This is the second blog in a series on new and emerging technologies’ impact on higher education. You can find the first one here. As in the previous blog, a lot of what I’ll be discussing is based on the NMC Horizon Report 2016. In this blog I’ll explore two very interconnected technologies, learning analytics and adaptive learning. 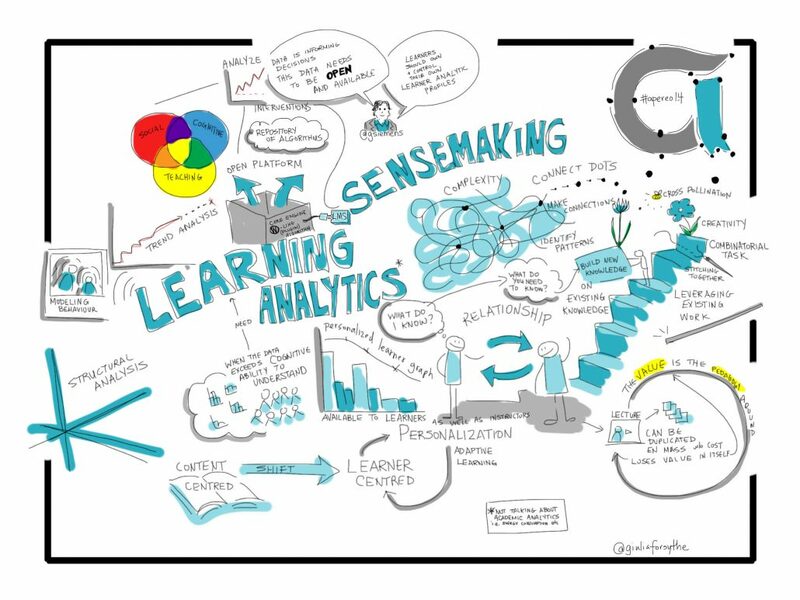 Learning analytics can be defined as how data about learners is measured, collected, analysed, and acted upon to optimize learning and the learning environments in which that learning occurs. Learning analytics data can be collected from a number of sources. Very commonly, we see this data collected from virtual learning environments such as Moodle or from authored Tin Can API compliant e-learning lessons created with software such as Adobe Captivate or Articulate Storyline. Learning analytics provides educators with the power to solve potential issues with e-learning including students lack of engagement, and motivation. With e-learning, teachers do not have those visual and interaction cues that generally signal learners’ difficulties in classroom settings. Learning analytics can identify at-risk students and learners that are not engaging with the materials. Thereafter, interventions can be instigated to support their studies. Analysis of learners’ habits, actions, interactions, failures and successes in their interactions with e-learning materials, allows educators to make predictions regarding learners’ requirements, and, if necessary, to make materials more effective. This will ensure courses are optimised and sustainable. There are, however, some potential issues in relation to the implementation and use of learning analytics. Ethical issues for learning analytics can be divided into three overlapping categories. The first is where data is located and how it is interpreted. Secondly, is the necessity for informed-consent, privacy and de-identification of data. Finally, there is the issue of how that data is managed, classified and stored. People may well feel that in this day and age, with the constant collection of Big Data through our browsing and shopping habits, that these aren’t really issues at all. However, what makes data in a learning context distinct, perhaps, is the way in which it relates to moral practice. It is the identification of students as developing participatory agents in learning analytics’ collection and use, and the requirement for transparency in its use thereafter. I wrote an in-depth blog on the ethics of implementing and using learning analytics in conjunction with a new flipped learning product for a corporate training department on my previous blog site. You can read that here. Adaptive learning is, well, it’s learning that adapts. Computers adjust educational interactions based on students’ learning needs. Those needs are established through the collection of relevant data from their individual responses to questions, tasks and any other activity that can provide actionable insights. Essentially, it’s learning analytics in action where the human component of interventions to plug learning gaps is replaced by computers. Here’s a nice illustrative video from Pearson Higher Education who are already very invested in the development and use of adaptive learning in their digital materials. Adaptive learning, therefore, is automated individualised learning. Let’s say, for instance, that someone is learning about how to build a house. The learner has already undergone units on breaking ground, laying foundations, and installing a floor. The student then does a formative test – an evaluation of their comprehension of what’s been covered in a course up to that point. The learner displays full understanding of most of the course content in the assessment but there are some key issues related to laying foundations in which there appear to be learning gaps. As a result, instead of the learner moving directly onto the next unit on building the walls, the course will interject additional learning activities on laying foundations to plug that gap which has been identified. This ensures that the course has been individualised to that particular learner. There is also the application that the differing individual learning styles of a learner might be identified and the types of activities that would be most effective for a learner would be used as opposed to those that have, according to the data collected as the learning journey has progressed, been less effective. For example, maybe a learner has displayed that they perform particularly well on tasks if there have been videos used in conjunction with reading texts. That learner would see more of those videos. Another learner might learn better through games and audio, and so the learning activities would be automatically tailored to their learning styles. So as mentioned above, adaptive learning adjusts to individual learners’ styles / levels of development. It can make predictions regarding what interactions are most appropriate for individual learners and in what order they are placed. A word there that’s repeated is ‘individual’. It’s this aspect of individualising the learning which has to be the technologies greatest benefit. This can result in improved student outcomes and a decrease in the alienation from traditional one-size-fits-all approach to learning. From the perspective of institutions and organisations that provide learning materials, it means that they can provide far more effective digital learning materials. Materials that provide the kind of corrective feedback and additional learning that was once the sole remit of traditional face to face classes with teachers performing that role. A Conclusion and What’s Next? Institutions and organisations providing this learning innovation may find themselves stealing a march on their competitors. If you, as a learner, can choose between an organisation that provides regular e-learning materials and another which provides materials that react to you as an individual with your own learning style and advance knowledge and level of competency on a subject that will almost certainly differ from other learners, then which one would you choose? In my next blog, I’ll be looking at what really perks the interest of a lot of people though not everyone recognises the potential game-changing benefits in their use in educational contexts – Virtual Reality (VR) and Augmented Reality (AR).